Home Crime Kent Police capture 24-time convicted felon without incident Wed.
Kent Police capture 24-time convicted felon without incident Wed.
Kent Police have been on the hunt for 37-year-old Jacob Steven Widener – a 24-time-convicted felon – for the past week, and on Wednesday morning (Jan. 31), police finally caught up with him at the Days Inn Motel in Federal Way. Police say that in April of 2017, Widener was charged with assault in the third degree for ramming a police vehicle, attempting to elude, and hit and run. He served little time and was released very soon after. Once out, Widener was quickly out committing more crimes with no regard to anyone or anything. Subsequently, additional charges against him came about, resulting in a $425,000 warrant being issued for his arrest. Widener was said to be armed with a firearm, and he made it known that he was not going to go down without a fight or would go by Suicide by Cop. Wednesday morning, through anonymous tips and Intel received, investigators learned that Widener was hiding out at the Days Inn Motel, 34827 Pacific Hwy S, in Federal Way. Just as officers were moving in on him, Widener spotted them and took off on foot wherein a brief foot pursuit ensued. Once officers encroached, he fled in the nearby wooded area. Widener eventually stopped, but he proceeded to put his hand down the front of his pants in a manner that suggested he was reaching for a weapon. Verbal commands were given to him to show his hands, and he was slow to respond, and he continued to make furtive movements. 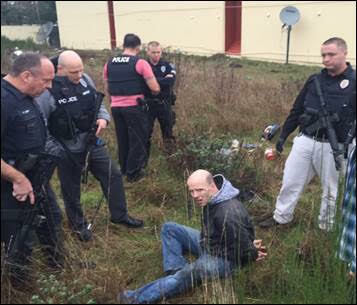 Finally, once he was surrounded, he surrendered and was taken into custody. A firearm was located just several feet away from Widener. “This is one of those cases where our officers used great restraint when deadly force would have been completely justified. This could have been a totally different outcome. I am very proud of the officer’s professionalism,” said Kent Police Chief Ken Thomas. “Thanks to the tipsters and great Police work, Widener is off the streets, and our community is safer because of it,” added Detective Melanie Robinson.